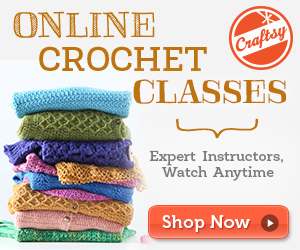 Congratulations on your decision to learn to crochet! Crocheting is a pastime which has been enjoyed for many years by our mothers and grandmothers alike. And, it has been popular for good reasons. Crocheting not only allows you to make some wonderful garments and household decorative items, but it also allows you to create while you relax and watch television or listen to music as well. Crocheting gives you an amazing sense of accomplishment when you are finished with a project. Whether you are making a blanket, sweater or even a simple scarf, you will be proud to show off your handiwork work when you have finished it. When you are first learning how to crochet you should stick to using natural fibres and yarns. These natural fibres tend to be less slippery and easier to work with. 1. Place the yarn over your little finger, below your ring finger, and above your fore and middle fingers. 2. Hold your crochet hook as you would a pencil or fork. This allows you the best hold to heave the yarn from your fingers down to the loop in the hook. As you begin to crochet more and more you will come up with just the right positions for you. But, it is always best to learn in a more classical style from the start and adopt your own style from there. When you purchase yarn or fibres for your projects make sure you take the time to get all of it from one dye lot. The packages of yarn will be marked with a number and you want to make sure they all match. This ensures that all of your yarn is an exact match to each other. One of the most important considerations for any crochet project is the size of the hook and the yarn you choose to use. Crochet hooks are labeled with numbers and letters. These numbers and letters correspond to different sizes. The higher the number or letter then the larger and thicker the size of the hook, and when you are new to crochet this means the quicker your project will be completed. Being new to crocheting offers some challenges. One of these is trying to learn to crochet well from a book or off of the Internet or television. Crocheting is one of those things which appears much harder than it really is. If you have a friend or relative who crochets, ask them to show you how. If you do not know anyone who crochets, then you might want to take a class at your local community college, or join a local crocheting group. While you can learn to crochet on your own, and many people have, it is a lot easier to learn when there are people around you who can show you what to do. Learning to crochet allows you to make new friends and to create beautiful works of art while relaxing at the same time. By taking care to use the right supplies for beginners, and for looking for groups where you can learn new techniques, you will be on your way to crocheting complex sweaters and blanket projects in no time. You will soon find that you have a long list of potential projects you want to complete.